It’s the right time of year to do a night rating (as we hit ‘official’ night (which is defined as sunset + 30 minutes) during normal club opening times), so I’ve decided to get this done. I don’t intend to fly at night regularly (in a single engine aircraft if an engine failure occurs at night out of range of an airfield then it’s entirely down to chance as to what happens, as you just have to aim for a dark area, you can’t pick a field etc as you do during the daylight), but I’d like to be able to fly at night so should I get caught out at any stage with needing a diversion (or if I get my planning wrong!) then it’s a) legal, and b) I know what I’m doing. The first lesson was basically an introduction, so we went up, did a little loop round Newmarket (which has a very obvious well lit astroturf pitch in the middle so nice and easy to recognise!) and then transited overhead the airfield (where the instructor pointed out the beacon that’s on the airfield, and highlighted how directional the runway lights are). Next up we headed out along the A14, where I noticed that Bar Hill Tesco is quite recognisable as the Tesco logo colours stand out from quite a distance, and then turned round and headed back to do a couple of circuits. The bits that surprised me were quite how far you can see some things (for example the mast at Sandy Heath) – apparently that can be disorientating for navigation, as you think you’re closer to something than you really are. Despite being warned about it, I was also surprised quite how strong the wind was at altitude, given it was quite calm on the surface. We did a couple of circuits – the difficult parts are knowing where the runway is when on downwind (because of how directional the lights are the airfield while downwind basically looks like a black hole), and maintaining the correct approach path. The PAPIs help here as they indicate visually if you’re on the right approach path (although later in the course I’ll practise some landings with them turned off), but it’s still very different than during the day. The disconcerting part is that while approaching the runway you’re essentially aiming for a black strip between the two lines of lights, and while it’s totally black underneath you. It reminded me a bit of when I first started working on circuits, and had to get over the fact that you essentially aim straight at the ground until the last moment when you flare – that took a bit of getting used to (I kept inadvertently trying to pull the nose up!). The first landing was very flat (judging the flare is much harder as you have to do it by the lights), but the second one wasn’t too bad. The next couple of lessons will be entirely circuits (first just getting normal ones right, then practising without the various aids like the landing light, the PAPIs, and with the runway lighting at different levels), following that we do a (dual) navigation exercise, and then some solo circuits. It should be a good course, and I’m looking forward to getting it done. While I’m waiting for the CAA to issue my license, I can still fly solo with an instructors authorisation – I did this for the first time today, on a little local flight. The wind was a little bit of a concern, as just as I was about to head out and start checking out the aircraft etc, it picked up a bit (such that it was still within limits, but only just, and I didn’t want to push myself too hard on this first post test flight! ), however the rise was temporary, and it went back to a more reasonable level so I satisfied myself I was OK to go. Once up I didn’t do too much as the visibility wasn’t brilliant, just went out to a major landmark (Grafham Water), and back, and then did a couple of circuits. On my second circuit (to land) there was a bit of confusion, with another aircraft ahead intending to do a touch and go, but ATC then instructing them to vacate at Charlie before they had a chance to get going (I’m fairly sure they had been cleared for a touch and go). I then had to make a rather late call ‘G-RC short final to land’ to remind the controller he hadn’t cleared me yet as he started asking the one ahead if they wanted to taxi back etc – fortunately the clearance came in time, otherwise I’d have had to go around, which would have been a little tedious. Today I took (and passed) my skills test! The week started with days of very low visibility and low cloud, so I wasn’t hopeful, but yesterday the forecast was looking very positive, and thankfully it proved correct. I’d been given the route the evening before so I was able to do my planning etc, and put the winds in and grab NOTAMs etc in the morning before heading in. I got to the airfield nice and early, and as I had a bit of time before the examiner arrived I checked out the aircraft so any issues could be dealt with early, and got it fully fuelled. I then did the necessary weight and balance and performance calculations (we don’t normally do these as with two people it’s essentially impossible to go outside of limits, and if the Cambridge runway were to be a limiting factor something is going very wrong, but it is a test requirement to demonstrate I can do them). When the examiner arrived, we had a briefing where he went through the various sections of the test explaining what he would be asking me to do, outlined who was responsible for what in each stage (broadly speaking I was responsible for everything, except navigation while doing the general handling etc, and lookout while we did the simulated instrument flight), explained the possible outcomes of the test (pass, partial or fail), explained that in general I was to treat him as if he were a passenger, except in the event of a real emergency when he would most likely take control. After that he had a quick glance at my weight and balance etc, and we then went through the club out brief prior to heading out to the aircraft. I offered to give a passenger briefing but this wasn’t needed, which avoided me having to feel very stupid telling someone who clearly knows it all already etc! At that point, it was just a normal departure – due to the wind runway 05 was in use (we normally use 23 as that’s favoured by the prevailing wind), so it meant a long taxy along the grass to the holding point for the other end of the runway – at least it gave the engine a chance to warm up so avoided a long wait. The takeoff was normal, so then it was just a case of heading to Point Alpha (a name the club has given to a road junction as it looks from above a bit like the symbol for alpha). Normally this wouldn’t be an issue, but I’m not used to doing it to from 05, and so started to get a bit concerned as I couldn’t locate it at first. I’d deliberately avoided turning towards where it should be until I was beyond the city, and then when I did I’d hidden it under the nose of the aircraft – once I’d found it, it was a case of turning onto heading, and informing the examiner the heading, speed and altitude I intended to fly the leg at, and once I’d calculated it an ETA at the first waypoint (I’m deliberately not giving the route as there are other people taking tests soon and the examiner might use the same one). The first leg went well, I had to nominate a new altitude a couple of times so I could climb / descend to avoid a few clouds, but everything appeared when and where I expected it. Also along the way I changed from talking to Cambridge Approach to London Information, as we would be heading outside of Cambridge’s coverage. I arrived at the first waypoint about 30 seconds ahead of my ETA, at which point I turned onto my next heading. 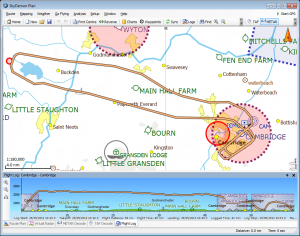 This leg would take me very close to another aerodrome’s ATZ (Aerodrome Traffic Zone) – while I was at an altitude such that I would have been above it, from an airmanship point of view I gave them a call to inform them, and find out if there was any other known traffic. 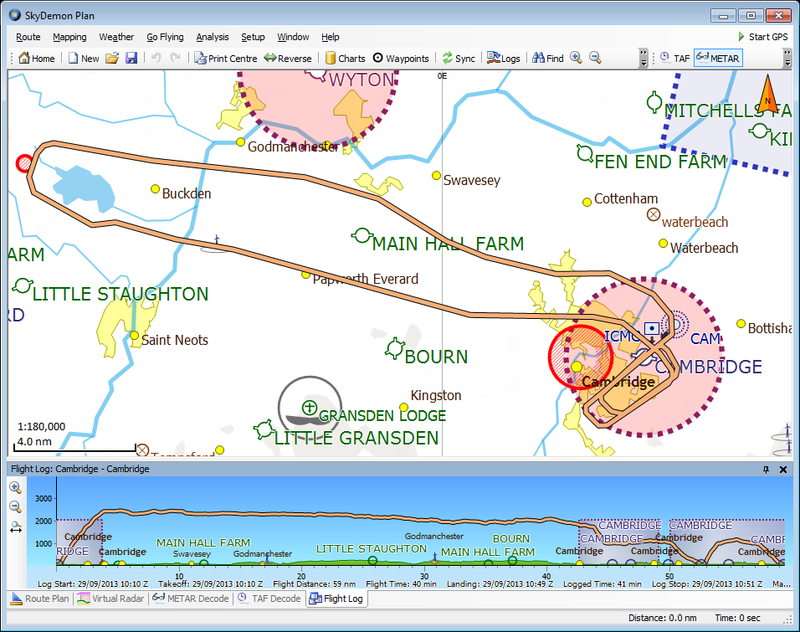 Once clear, I switched back to London Information (in the debrief afterwards the examiner suggested that I might have been better to go to another aerodome’s approach frequency instead). The examiner asked me to identify a small town/village out to our side, which I (eventually – there weren’t many unique features!) did, and he then asked me to plan a diversion from this location to another. I drew a line on my chart, and estimated a heading and distance. I then turned onto it, informed the examiner of the heading, and once I’d estimated it gave him an ETA. I chose a point about half way to check how I was doing – I was a little bit off track once it came into view, so I adjusted my heading to compensate and informed the examiner of the change. The destination (which as a small airfield) came into view a little to my right, and after verifying it was the correct location, I headed for it, arriving almost exactly on my ETA, which was nice. At this stage the examiner became responsible for navigation, and we started the air work. We went through the various exercises, which in general all went very well. The ones I was most worried about were the steep turns and the PFL – the level steep turns were fine, though my descending turn I did end up with the speed starting to get away from me a bit, but the examiner was happy enough with it. The PFL was made quite easy as we started it from around 4000′ (giving more glide time to make decisions etc), and there was a field perfectly shaped and oriented into wind that I could see. I ended up a little high as I approached (something I have a tendency to do, though this is better than too low!) and had to do some S turns, but the examiner was happy we would have got into it safely. On the climbout we then did a simulated EFATO (Engine Failure At TakeOff), which was fine. At this point it was time to head back to Cambridge for the circuits. The field came into sight nice and early, and I requested and was given a left base join, which saved some time. The circuits went very well, with two of the landings being some of my best ever. On the glide circuit (which was to land) I ended up a little high (as I mentioned, I have a tendency to do this! ), but nothing that a couple of S turns couldn’t sort out. It was then just a case of taxying back in, and going in to get the good news and fill out all the paperwork. I was a little dehydrated by the end, but overall I was very happy with the flight – the only part I knew I could do significantly better was the descending steep turn. Once the CFI gets back into the club (which should be on Monday) I need to get various bits of paperwork sorted out and signed, and then send it all off to the CAA in order to get my license. In the meantime I can fly solo with an instructors authorisation, but I can’t take any passengers until the license comes through and I have it in my hand. As you would expect I’m very happy at the moment (in a similar way to my first solo I’ve not been able to remove the grin from my face yet) – I’ve booked my first solo slot for Sunday morning, so weather permitting I’ll have a bit of a bimble in the local area etc. Today’s lesson was aiming to cover the things I was less confident on, we got through most of them, with the exception of cross wind practise, as there was very little wind at all today. First up was a PFL – while in general I got the procedure correct, there were a couple of things I didn’t do so well at – one was I forgot to warm the engine until quite late (then did a pathetic attempt at warming it! ), and the other was that I forgot that there was very little wind, and so should have taken my flaps nice and early but didn’t, such that my first attempt I would have missed the field. We did another, which went a lot better, so that was good. Next up was a practise diversion from Bar Hill to Littleport – I came up with the heading and turned onto it, my initial ETA was too long, but this was fixed at the half way point as I got there nice and early. I had to call Lakenheath to get permission for MATZ penetration – I always dread doing this as they can be quite hard to understand at times, though today the controller was nice and clear which was good. During the diversion my altitude holding was a little all over the place, so this is something I’m going to need to watch (I’ve always found it a bit tricky). The instructor also noticed that when checking position etc, I was trying to go map to ground, when actually with good visibility it’s best to go ground to map, and also look further ahead for obvious landmarks (in this case Ely Cathedral was a nice reference). Then back to Cambridge – after a bit of fluffing up the RT when changing back to Cambridge (passing info to approach that I should have given to tower, and vice versa), we did a PFL from the overhead, which went OK, then finished off with a low level circuit. In general I was very happy with the lesson, while I made some silly mistakes, I think I got a lot of useful tips and practise. After a nearly 2 month gap due to work committments and my general stress levels not being conducive to flying, I had two lessons this week. Both lessons involved circuits, as the cloud base wasn’t suitable for going out in to the local area. My first circuit was (as you might expect) a little all over the place – getting the right attitudes back into my head etc, though the landing was actually one of my better ones, which I was quite glad about. The other circuits went fairly well, including a couple of flapless ones. The main issues I had were that I was not kicking it totally straight before touchdown, and was often a little flat as well, which is not ideal as you want to try and keep the weight off the nose wheel for as long as possible. Today’s looked like it might not happen at all at first, as the cloudbase was reported as broken at 700 feet when I arrived, but fortunately it rose sufficiently to let me get some flying in. We did a couple of precision landings – the first I ended up turning on to base a little too early, and so nearly the entire approach was done at idle, and I ended up a little fast by the point I reached the numbers, thus touched down beyond them. The second was better in terms of aim point, but I did have a small bounce on touchdown, I think because I effectively ended up trying to drop it onto the numbers (my target) rather than smoothly taking the power out and allowing it to land on them – i.e. I didn’t anticipate taking the power out early enough. After the precision we were able to avoid the clouds sufficiently to do a couple of high glide approaches. The first one ended up quite long (I should have taken my 3rd stage of flap, but by the time I realised this it was a little late to do so) – unfortunately I then over-corrected for this on the second, and ended up having to sneak a bit of power in to avoid landing short, the actual touchdown was then a little all over the place (it was sufficiently bad that if I’d been solo I’d have gone around, but the instructor helped me control it). All in all, I was quite happy – despite two months not flying I seem to be at pretty much the same point I was at (in fact the glide / precision landings I did today were much better than my last attempt at them) – if the good weather continues I’m hopeful of being at test standard in the relatively near future! I intend to send the below letter to the PCI SSC outlining some (hopefully constructive) criticism of the PCI Data Security Standards. For those not familiar with them, in simple terms they are a set of rules that anybody dealing with credit card data has to follow and comply with (there’s a lot more detail to it with different tiers depending on how many transactions you process etc etc). As a disclaimer, the contents are purely my personal views, and do not represent the views of any company I operate or have done work for. Now that my QXC is out the way, I’m currently doing various ‘revision’ flights to make sure I’m ready for my skills test. This basically involves going over things I haven’t/hadn’t done for a while, both general handling tasks such as practice forced landings (PFLs), steep turns and stalling, and the various types of circuit (normal, flapless, glide, low-level and precision), making sure I remember what I’m doing, and ensuring my technique is as good as it can be. While I’ve not had any serious issues with any of this, it’s interesting how I have needed a few attempts at some of the tasks to get them ‘right’ again – in some cases I wonder how much of this is due to lack of practise, and how much is due to my general awareness being better now so I’m actually realising my own mistakes a lot more than I was when I did these exercises the first time round. The other task I’ve had is to get my remaining ground exams out the way, I’ve already done flight planning and performance and the communications written, so all I have left now is ‘Principles of Flight and Aircraft General’, and the RT (radio telephony) practical test, plus an internal club things called Expanded Brief 3 which is more of a discussion point than a ‘test’. I got to the airfield, checked over the NOTAMs etc, and my instructor had checked over my route planning to make sure it was all in order. After the paperwork, I went out and preflighted the aircraft (G-SHWK), and then we did a single circuit as a dual check to make sure I still remembered how to fly. With that out the way, it was time for me to head off on my own. After departure it seemed air traffic were a little confused as while I was approaching 2000′ heading out to the East they instructed me to orbit for spacing in the circuit – this was quickly resolved after I explained I was departing on a cross country ? The point I was using to start the route is a place known as six mile bottom, recognisable by being where a railway line crosses the A11. This was the first time I’ve approached it after taking off on 05, and I did initially manage to fly straight past it, so I did a 180 degree turn and got back to it. After that I turned on to my heading for the first leg to Framlingham, and then noted down the time and did a quick gross error check. I had quite a while until my first checkpoint as I had a 20 knot headwind – eventually however Bury St Edmunds appeared – I was slightly left of track so I made a correction for this. The rest of the leg proved uneventful, I made contact with Wattisham Approach to get a MATZ penetration, and other than a couple of further adjustments to my heading as I was still drifting left a bit I made it to Framligham with no problems. I did encounter a nice demonstration of the effect of thermals however – there were a few breaks in the clouds allowing sunlight to the surface, and as I flew over those sunlit areas I would start to gain height if I didn’t compensate – I’ve never experienced it this obviously before, but I think the cold temperatures meant it had an exaggerated effect. For the next leg to Snetterton Heath I tried to compensate for the fact my first leg had shown the wind was not doing exactly what was forecast – I realised once I could see Eye and Diss that I’d slightly overcorrected as I was ending up a bit to the right of my planned track, so I picked a heading in the middle which seemed to work well. Once Snetteron Heath appeared (it’s a disused airfield which now has a race track, making it very easy to recognise from above), I turned on to my next heading back towards Cambridge (attempting to adjust for the wind). I then made contact with Lakenheath approach to get approval for entering their MATZ. I realised as my first checkpoint came into view I’d slightly overcorrected, so I adusted my heading slightly. After clearing the MATZ, it was just a case of contacting Cambridge Approach and heading in. Upon contacting Tower I did rather foolishly request a crosswind join, which was impossible as it would have required me to be the other side of the airfield to do, however Tower realised this and gave me a downwind join instead, which was the right answer. The landing was a little flat, but I touched down with an almost zero rate of descent which is ideal (if I’d have had the nose a little higher so it wasn’t as flat then it would have been what’s known as a ‘greaser’, or essentially perfect landing). It was then just a case of taxiing back, shutting down and heading in to complete the paperwork, and pay for the total of 95 minutes of flying (which my wallet didn’t like! ).